We know, you’re busy planning your summer vacations. Or perhaps you already have, and are now just dreaming about said plans in light of potential threats of an unusual April storm to dump snow and heavy rain on the Central U.S. But we have something else to put on your to-do list while you’re thinking ahead to July. That’s register for the Auto Intelligence Summit, of course! 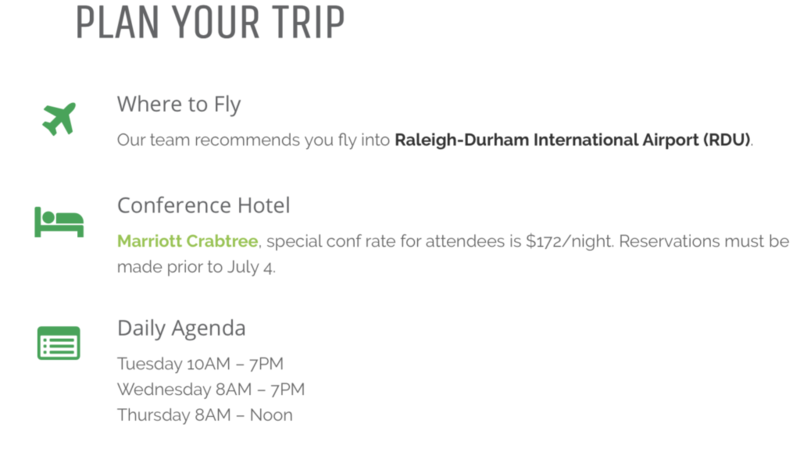 Early registration for the July 23-25 event at the Marriott Crabtree Valley in Raleigh, N.C., just opened this week. Early Bird Registration for the Automotive Intelligence Summit will save attendees a significant $400 off on-site registration. And don’t wait too long. Rates go up by $200 come June 7, when the Early Bird period closes. And we think we already have plenty in store for AIS 2019 to convince you to make the trip to N.C. this July. Learn from the companies driving the future of auto. Save today with AIS 2019 Early Bird Registration. The event is located in Crabtree Valley, just minutes away from Downtown Raleigh and the Research Triangle Park — a hub of innovation and home to more than 250 businesses. Let’s talk about content — what we focus on to ensure AIS 2019 is worth your time, yes — but also in an effort to bring leaders and brilliant minds together in one place to spark creative discussion and perhaps even turn the dial on the future of auto. Last year, we covered topics like artificial intelligence and machine learning. Connected vehicle services. Vehicle intelligence. The potential of big data. Predictive modeling in auto finance. The future of cybersecurity. In 2019, we will revisit many of these topics and more, as well as drill down specifically into the challenges and possibilities of Fintech and Digital Retailing. Finance folks, take note! — Because we like to start things off big here at the Auto Intelligence Summit, we will be kicking off the event with a discussion featuring some of the top minds in auto finance. What’s the next big thing for lenders and banks? Dive into the latest in Fintech and more with Sharon Mancero, Senior Vice President, Wells Fargo Preferred Capital, and other finance leaders. And Later in the event, Bill Zadeits, Chairman of AIS, will sit down with Ryan Bachman, SVP Global Chief Information Security Officer, GM Financial, for a conversation that will broach topics like cybersecurity, and the implications for Fintech, AI and Big Data. Wednesday will kick off with a fresh look at Digital Retailing from one on the front lines of this evolving market: Andrew Tai, CEO at MotoInsight, which is looking to redefine auto retail by allowing shoppers to complete their entire purchasing journey on any device. Later that morning, we will take a look at Customer Experience, and how this lies at the center of most new innovative technology. In fact, that’s the push behind most Internet of Things (IoT) tools: improving the end-user experience. An expert voice on that topic will be on site for AIS 2019; Lonnie Miller, principle industry consultant at SAS, will lead this panel. Stay tuned for further lineup for this discussion! Where are today’s top venture capitalists putting their funds to fuel tech of the future? Eyes are on auto, that we all know. Jeremy Alicandri, Managing Director, Maryann Keller & Associates, will lead this discussion. Let’s touch on one more point — but that’s not all we have locked down — (I’m just going over SEO text limit suggestions…) See the full lineup of confirmed speakers so far. Interested in the intersection of data privacy and regulatory oversight in debt collection? Stay tuned for a panel discussion including Mary Ross, President of Californians for Consumer Privacy, and former CIA Counterintelligence Officer and Counsel on the House Intelligence Committee, and more.